In 3 easy steps you can Choose your Publication, Choose a Presentation, Make a Purchase and have the present sent to someone. Use the Quick Search or our Publication Finder and select your Region, Publication Type and Date. Search our extensive range of newspapers and magazines that willl turn into that perfect present for someone. Read about our Newspapers and Magazines archive and filter our item availability using the Date Filter. Add items into your shopping cart and choose from our range of Presentation Options to make the present just that special. Choose from our Deluxe Folder, Classic Folder and add your plague or Optional Personalised Calligraphy.  All of our Newspapers and Magazines come with a certificate of authencity. Making a payment is easy on our trusted site. We accept Visa and Master Cards and PayPal. Use a Promo code upon check out for some awesome discounts. Fill in your delivery details and your postage option and the present will be posted in the mail as it is approved and finalised. If you are placing an online order, Paper World accepts payment by Visa , MasterCard and PayPal. Don't have a Credit Card? If you do not have a suitable Credit Card, you can place a postal order by sending us a cheque or money order with our printable order form. Please see our offline ordering options below for further information. To choose any of the titles available, simply click "Add to Cart" to commence the ordering process. Our folders - to add any of these options simply click "Select"
Our calligraphy service - simply enter the wording and follow the prompts. You will then be prompted to select a postage type and check out. Once checked out, you are then asked for your contact and delivery details - just fill in the fields accordingly. Finally, you will be asked to provide your Credit Card details for processing via our secured Commweb payment system. The order is then submitted and, once accepted, you will be automatically notified and provided with an online order number. Within the next business day, you will receive a follow up email from our staff to confirm when your order will be dispatched. Just phone our friendly staff on Freecall 1800 811 755 between 8.30am and 5pm (Eastern Time) Monday - Friday. Payment accepted by Visa , MasterCard and PayPal only. Calls from outside Australia can be made to +61 3 9329 4333. If you are making Payment by cheque or money order: Paper World accepts business, bank and personal cheques as well as Australia Post money orders.